Use the Perceive, Process, Perform, and Evaluate method as a continuous model for every aeronautical decision that you make. Although human beings will inevitably make mistakes, anything that you can do to recognize and minimize potential threats to your safety will make you a better pilot. Depending upon the nature of the activity and the time available, risk management processing can take place in any of three timeframes. [Figure 2-10] Most flight training activities take place in the “time-critical” timeframe for risk management. The six steps of risk management can be combined into an easy-to-remember 3P model for practical risk management: Perceive, Process, Perform with the PAVE, CARE and TEAM checklists. 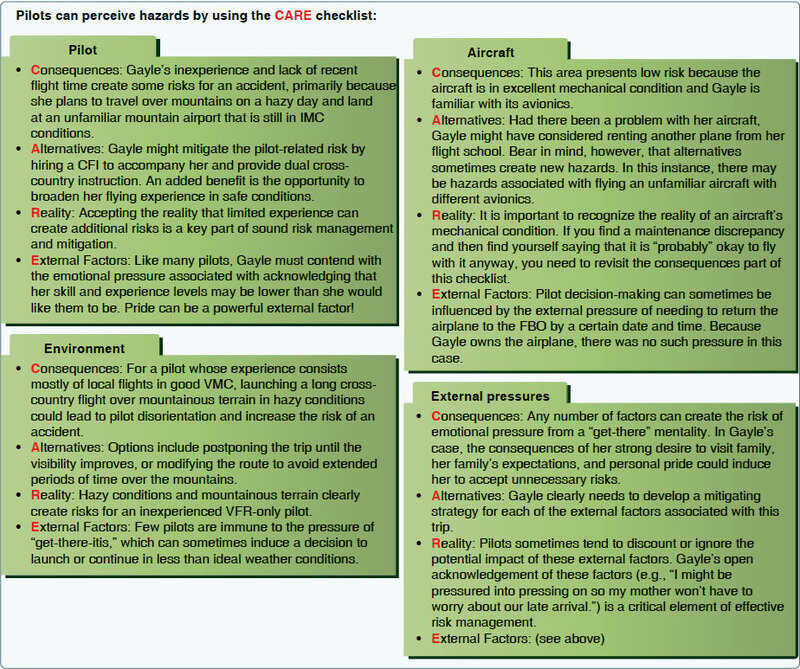 Pilots can help perceive hazards by using the PAVE checklist of: Pilot, Aircraft, enVironment, and External pressures. They can process hazards by using the CARE checklist of: Consequences, Alternatives, Reality, External factors. Finally, pilots can perform risk management by using the TEAM choice list of: Transfer, Eliminate, Accept, or Mitigate. In the first step, the goal is to develop situational awareness by perceiving hazards, which are present events, objects, or circumstances that could contribute to an undesired future event. In this step, the pilot will systematically identify and list hazards associated with all aspects of the flight: Pilot, Aircraft, enVironment, and External pressures, which makes up the PAVE checklist. [Figure 2-11] For each element, ask “what could hurt me, my passengers, or my aircraft?” All four elements combine and interact to create a unique situation for any flight. Pay special attention to the pilotaircraft combination, and consider whether the combined “pilot-aircraft team” is capable of the mission you want to fly. For example, you may be a very experienced and proficient pilot, but your weather flying ability is still limited if you are flying a 1970s-model aircraft with no weather avoidance gear. On the other hand, you may have a new technically advanced aircraft with moving map GPS, weather datalink, and autopilot—but if you do not have much weather flying experience or practice in using this kind of equipment, you cannot rely on the airplane’s capability to compensate for your own lack of experience. A good rule of thumb for the processing phase: if you find yourself saying that it will “probably” be okay, it is definitely time for a solid reality check. If you are worried about missing a meeting, be realistic about how that pressure will affect not just your initial go/no-go decision, but also your inflight decisions to continue the flight or divert. Eliminate—Is there a way to eliminate the hazard? Accept—Do the benefits of accepting risk outweigh the costs? Mitigate—What can you do to mitigate the risk? The goal is to perform by taking action to eliminate hazards or mitigate risk, and then continuously evaluate the outcome of this action. With the example of low ceilings at destination, for instance, the pilot can perform good ADM by selecting a suitable alternate, knowing where to find good weather, and carrying sufficient fuel to reach it. This course of action would mitigate the risk. The pilot also has the option to eliminate it entirely by waiting for better weather. Once the pilot has completed the 3P decision process and selected a course of action, the process begins anew because now the set of circumstances brought about by the course of action requires analysis. The decision-making process is a continuous loop of perceiving, processing, and performing. With practice and consistent use, running through the 3P cycle can become a habit that is as smooth, continuous, and automatic as a well-honed instrument scan. This basic set of practical risk management tools can be used to improve risk management. Using personal minimums checklist to make some decisions in advance of the flight. To develop a good personal minimums checklist, you need to assess your abilities and capabilities in a non-flying environment, when there is no pressure to make a specific trip. Once developed, a personal minimums checklist will give you a clear and concise reference point for making your go/no-go or continue/discontinue decisions. Develop a list of good alternatives during your processing phase. In marginal weather, for instance, you might mitigate the risk by identifying a reasonable alternative airport for every 25–30 nautical mile segment of your route. Preflight your passengers by preparing them for the possibility of delay and diversion, and involve them in your evaluation process. Another important tool—overlooked by many pilots— is a good post-flight analysis. When you have safely secured the airplane, take the time to review and analyze the flight as objectively as you can. Mistakes and judgment errors are inevitable; the most important thing is for you to recognize, analyze, and learn from them before your next flight.